WHAT IS HYPERWEAR'S RETURN/EXCHANGE POLICY? We know that sometimes a product doesn’t work out and at Hyperwear we offer a 30-day customer satisfaction policy. We will issue a full refund or exchange on unused items purchased from Hyperwear.com within 30 days of receipt and returned to Hyperwear within 60 days. Please initiate your return or exchange request for authorization and additional instructions. Items must be returned to Hyperwear in good saleable condition and if possible in original packaging prior to any exchange product being shipped back to you. Return shipping is at the customer’s expense and must be sent with tracking via FedEx, UPS or United States Post Office. Please allow 7-10 business days for processing. *Sales and promotions are not retroactive. Discounts may not be combined and coupons are valid on full price items only. Hyperwear is not liable for packages lost or stolen after confirmed delivery. Please ship to a secure address and contact us about the Walgreens Safe Delivery option. Hyperwear products are designed to last with proper use and handling. We stand by our products so should you experience a defect or unusual wear and tear please reach out; please note normal wear and tear is not covered. We warranty our products to be free from defects in materials and workmanship under normal use for 12 months from date of purchase. With proof of purchase your exclusive remedy under this warranty is that we will replace (one-time in-kind replacement), without charge, Hyperwear products purchased on Hyperwear.com, Amazon or other authorized seller site. This warranty does not apply to any unit which we determine has been subjected to abuse, alteration, neglect or misuse such as damage caused by sharp objects, rough and abrasive surfaces or mishandling according to our care and use guide. Care and use guide can be found on product pages. Please initiate your warranty request for authorization and additional instructions. Items must be returned to Hyperwear, prepaid, prior to any warranty exchange product being shipped back to you. Please allow 7-10 business days for processing and 1-3 days for return shipping. WHERE CAN I FIND HYPERWEAR TRAINING RESOURCES? There are a number of places you can go for Hyperwear training information and workout suggestions. CAN I PURCHASE HYPERWEAR PRODUCTS IN ANY U.S. RETAIL STORES? CAN I PURCHASE HYPERWEAR PRODUCTS OUTSIDE OF THE US? Yes, we have a number of Hyperwear Non-US distributors who sell our range of products. Please contact us at customerservice@hyperwear.com for more information. Please note that any taxes or fees incurred as a result of importing into a Non-US country is the sole responsibility of the customer and not Hyperwear. WHAT SIZE VEST SHOULD I ORDER? To determine the best weight vest size for your height and weight please view our Sizing Chart. The weight vest should fit snugly and hug your core. Side laces allow you to adjust the vest to best fit your torso, which removes some of the load from your shoulders making the Hyper Vest PRO weight vest the most comfortable weighted vest on the market. If you still have questions please Contact Us directly. WHAT IS THE MAXIMUM WEIGHT EACH VEST SIZE CAN HOLD? HOW MUCH WEIGHT SHOULD I USE IN MY VEST? This all depends on what type of activities you are performing. The Hyper Vest PRO comes pre-loaded with zinc-coated steel weight bars for a total weight of 10 lbs. The Hyper Vest ELITE comes pre-loaded for a total weight of 10 lbs plus an additional 10lbs of weights (except size Small.) We recommend starting with 10lbs or less, until you become familiar and comfortable with using a weight vest. You can then adjust the amount of weight to suit your goals and type of activity. General guidelines recommend between 5-15% of your bodyweight. For strength training exercises, such as pull ups, dips and push ups you can use closer to the higher end of the range. While for cardiovascular-type activities like running and plyometric-type exercise like jumping and bounding we recommend sticking to the lower end of the range. CAN I GET MORE WEIGHT FOR MY VEST? Yes, extra weight Booster Packs are available here. Each 5lb box contains 36 individual zinc-coated steel weight bars (2.25oz each) allowing you to increase in small increments. IS IT EASY TO ADD AND REMOVE WEIGHT FROM MY WEIGHT VEST? Yes, adding and removing weight to and from the Hyper Vest PRO & ELITE is very quick and simple. Individual weight bars can be removed by pulling back the black webbing on top of the pocket then pushing the weight up from the bottom. To insert, simply slide the weight bar into the pocket and ensure the black webbing is closed over the top. Each pocket can hold up to two weight bars. Check out this video of the process. ARE THE HYPER VESTS ADJUSTABLE? Yes, the Hyper Vest PRO & ELITE weight vest feature flexible side lacing for a highly-adjustable fit. The lacing can be cut to your desired length and tied at each end in a small knot. 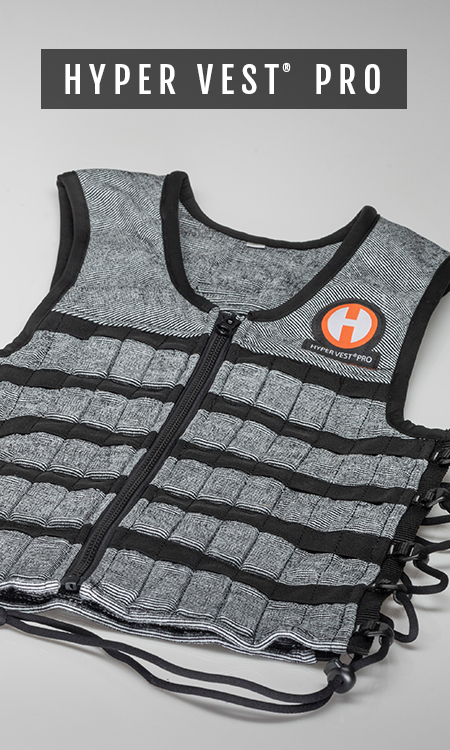 It is also one of the only weighted vests that zips on and off (most other weight vests use Velcro straps or belts). The zipper also you to quickly put on and take off the Hyper Vest PRO or ELITE, as well as unzip it partially to allow for increased air flow. WILL THE WEIGHTS BOUNCE UP AND DOWN IN MY VEST WHEN I JUMP OR RUN? 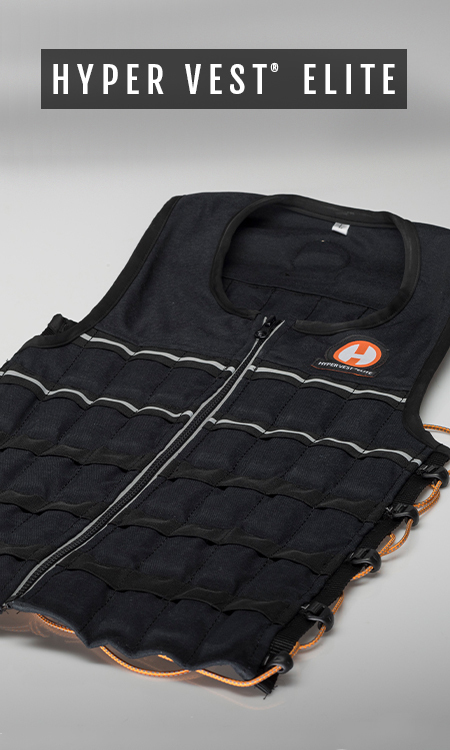 No, our weighted vests feature a patented design that limits vertical movement eliminating any bounce. The design also provides for flexion in the horizontal plane, allowing for full chest expansion while breathing, keeping the weights in place even during vigorous, multi-plane movements. HOW SHOULD I CLEAN MY HYPER VEST? The Hyper Vest PRO & ELITE weight vests are made from breathable, odor-resistant fabrics so you do not need to wash it every time you use it. After use lay the vest flat to air out. You can also spray it with a little Febreze from time to time. For more extensive cleaning we recommend hand washing in a sink with a mild soap or detergent, rinsing, then wringing the excess water out in a towel, and laying the vest flat in a cool, dry place to dry completely. You do not need to remove the weights for this. You can also wash the vest in the washing machine using a delicate cycle, then, lay flat to dry. Be sure to remove all the weights before putting weight vest in washing machine. ARE THE HYPER VEST PRO & ELITE WEIGHT VESTS DURABLE? Yes. The Hyper Vest PRO weight vest is constructed of a very tough fabric called Tyvex that is patented by DuPont and is extremely durable. The Hyper Vest ELITE is made from ultra durable CORDURA® with added reflective striping for safety. If excessive fraying or wear does appear, please submit a warranty request HERE. To reduce wear and tear on your weight vest DO NOT DROP from any height or let the vest strike or rub on hard or abrasive surfaces, and AVOID ground or mat exercises or other moves where excessive friction may occur. This type of damage is not covered under our limited warranty. CAN I WEAR MY HYPER VEST UNDER A SHIRT OR BLOUSE? Yes, the Hyper Vest PRO & ELITE’s slim profile allows for exceptional wear-ability and comfort. The ¼ inch thick high-density steel weights make these weight vests barely detectable under a shirt. They also feature a scoop neck cut that will help hide your weight vest under clothes. WHAT'S THE DIFFERENCE BETWEEN A SANDBELL AND A STEELBELL? There are a few structural differences between the SandBell and SteelBell as well as some training differences. First and most obvious, the SandBell is filled with sand, while the SteelBell is filled with steel shot, which is twice as dense. Since the steel shot is denser it makes the SteelBells smaller in diameter and footprint compared to SandBells of the same weight. 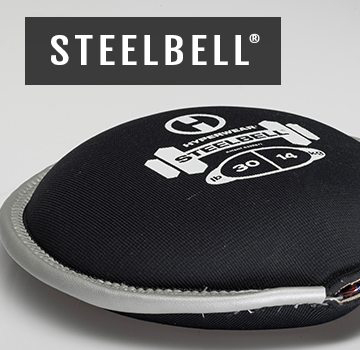 Multiple SteelBells will therefore take up even less in a facility than other types of equipment like dumbbells, kettlebells or medicine balls. The neoprene on the SteelBell is slightly thicker than the SandBell and has a textured exterior for improved grip. Both are extremely challenging on grip, hand and wrist strength. The steel shot also has less friction so it moves around more than sand, which increases the instability and grip characteristics and makes every movement more intense and engaging. Both are extremely durable, using high quality materials and a patented design to create a free weight like you have never before experienced. They are both also great for all the traditional free weight exercises as well as countless explosive power movements such as slams, tosses and throws. Its versatility makes it ideal for many types of training from general strength and conditioning, to endurance based circuit as well as sports performance. CAN I BUY EMPTY SANDBELLS OR STEELBELLS? SandBells can be purchased filled or empty. A funnel is required to fill an empty SandBell. Instructions are provided with your empty SandBell. We recommend using washed dry play sand, which is available from most home improvement stores. View this video tutorial on how to properly fill. SteelBells are only sold filled. WHAT TYPE OF SAND SHOULD I USE TO FILL AN EMPTY SANDBELL? We recommend a washed, dry play sand like Quikrete Play Sand available at most home improvement stores. HOW DO I FILL AN EMPTY SANDBELL? Check out our filling tutorial video. HOW SHOULD I GRIP A SANDBELL OR STEELBELL? Both the SandBell and SteelBell challenges grip strength by engaging the hand wrist and forearm with every move. 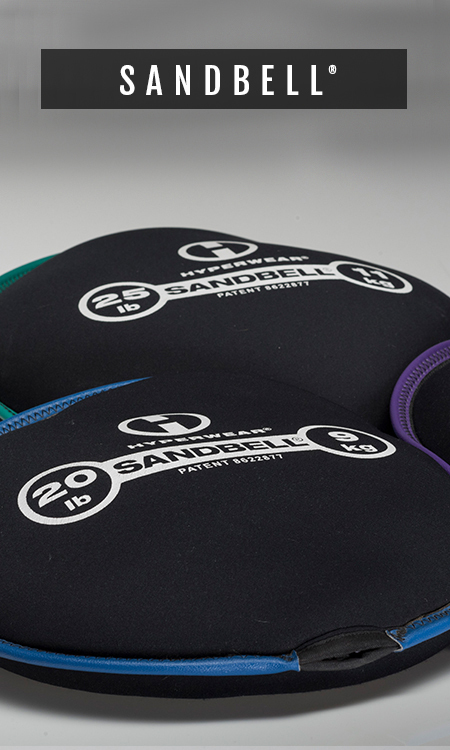 When gripping a SandBell, grab a handful of sand and neoprene. DO NOT grip by the outer vinyl trim alone. The Center: Grip the center of the SandBell in one or both hands making sure to grab a handful of sand and neoprene with each hand. The Claw: Grip the outer edge of the SandBell in one hand making sure to grab a handful of sand and neoprene. DO NOT grip by the vinyl trim alone. The Double Claw: Grip the outer edge of the SandBell in both hands making sure to grab a handful of sand and neoprene with each hand. DO NOT grip by the vinyl trim alone. The Cradle: Grip the center of the SandBell in one or both hands making sure to grab a handful of sand and neoprene with each hand. ARE SANDBELLS SUITABLE FOR CHILDREN? The SandBell is extremely safe for all ages. The patented, innovative disc design and sand filling allows for the weight to expand and force to dissipate over the surface area of the bag. So Hyperwear has extensive SandBell physical education resource material for kids, and it is the safest free weight for children. Contact Us for more information. HOW SHOULD I CLEAN MY SANDBELL OR STEELBELL? Wipe down and clean your SandBell or SteelBell using a damp cloth. Spraying with an odor-eliminating product like Febreze®or OdoBan will help to handle any odors and keep your SandBell and SteelBell smelling clean and fresh. Be sure to leave out and let air dry in a well ventilated area and avoid stacking damp SandBells in an area with no air flow. WHAT IF I GET MY SANDBELL OR STEELBELL WET? SandBells and SteelBells are extremely versatile free weights that are great for outdoor training for bootcamp, crossfit or obstacle course racing. You can get them wet, just be sure to dry them out completely to avoid mildew. Since the SteelBell is filled with steel shot, you should avoid getting it excessively wet, as the steel shot can rust. This is not covered under our limited warranty. CAN I SLAM MY SANDBELL OR STEELBELL? Please do it’s the best unique feature and benefit. Use a good squat to reach down and pick it up and you just found the secret to an incredibly effective full body exercise that gets your heart rate up. Get more results in less time with a SandBell and SteelBell. CAN I REPAIR A SANDBELL OR STEELBELL IF THERE IS A PUNCTURE? Punctures and cuts are not covered under our warranty policy. Avoid using your SandBell or SteelBell on any surfaces where a puncture or cut may occur. Contact Us for tips on repair options for punctures or cuts/tears. ON WHAT SURFACES CAN I USE MY SANDBELL OR STEELBELL? The patented, innovative disc design and filling allows for the weight to expand and force to dissipate over the surface area of the bag. This makes the SandBell and SteelBell extremely safe for all surfaces including hardwood studio and gym flooring. We do not recommend using a SandBell or SteelBell on hard, abrasive surfaces like concrete or asphalt as these can rapidly increase the wear and tear. WHERE CAN I FIND MORE INFO ON SANDBELL GROUP EXERCISE CLASSES? Check out more info on SBGX here. WHAT IS THE DIFFERENCE BETWEEN A SANDROPE AND A BATTLE ROPE? While the SandRope shares many similarities with traditional battle ropes, it also differs in some major ways. To begin with, SandRopes are weighted (15 or 30lbs) and are only 10ft long compared to 25-50ft long for battle ropes. SandRopes can be used anchored like a battle rope or unanchored. SandRopes a much wider range of exercise possibilities since they can be used anchored or unanchored. HOW DO I ANCHOR MY SANDROPE? To properly anchor your SandRope, loop one end of the nylon webbing around or through a secure anchor point or object. Thread the other end of the nylon webbing through this loop and pull tight. Attach the loose end of the nylon to the carabineer, which is attached to the end of the SandRope. Check out the instruction video here. DOES THE SANDROPE NEED TO BE ANCHORED? The SandRope can be used both anchored or not, which provides for a larger variety of exercises. Anchored, the SandRope is great for all types of traditional battle rope exercises. Unanchored it can be used for countless other movements such as slams, carries, pull-ups, dips and much more. WHAT IS THE PURPOSE OF THE SANDROPE COLLAR? The SandRope Collar Accessory is designed to trap sand at one end of the SandRope making a handle. During anchored exercises, sand will shift away from you towards the other end. Wrap around the collar around the SandRope approx. 1 1/2 feet from one end to trap sand for a good consistent grip. We recommend regularly switching direction to re-distribute sand evenly.